Electronic management of your Athletic Medical Record has never been simpler. All of your pre-participation forms are available online and within the DragonFly MAX mobile app. Each organization starts with a standard packet of forms, but these packets can be customized based on your state or which forms your particular state or school requires for participation. As parents and athletes complete forms, these are stored securely in the Athletic Medical Record. Forms data is always available on your mobile device (even when offline). 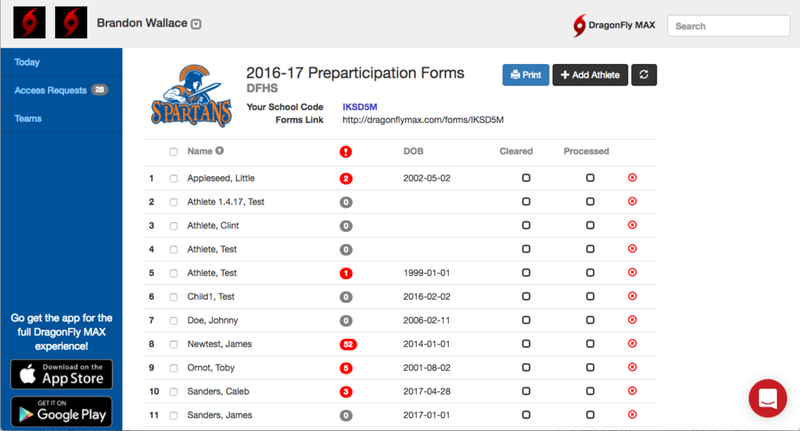 Also, the forms data integrates with your Athlete Profile and Team Lists. Complete these forms online and they are instantly available on your school’s Athletic Trainers, Coaches and Administrators mobile devices…. No more lugging a mountain of paperwork to the game! Everyone involved in the safety of your student-athlete can now complete and manage this information in just minutes. Plus, you’ll always know the exact status for each team member. Each year your athlete's paperwork comes in and there is a ton of important information found in those documents. How do you find the information that is most important? MAX helps bring your list of health history red flags to the top of your list, so you can quickly view what the athlete says is important to know about his/her previous medical history. Simply tap on one of the red flags and the explanation of this questions pops to the top of the window.